When the deadline arrived for Christoph Zepeda to apply to transfer from Santa Barbara City College to UC Santa Barbara (UCSB), he needed a grade-point average of 2.75. He had a 2.79. “I just barely got in there,” recalls Zepeda, who will earn a master’s degree in clinical rehabilitation and mental health counseling from SF State this spring. This near-miss was just one of many pivotal moments in an academic journey full of unplanned twists and turns — but following this uncertain road, Zepeda has found a profession he feels passionate about and a voice he uses to help others. Zepeda’s academic trajectory first veered from the norm at 16, when he dropped out of high school to attend community college full time. A self-described “emo” outlier in high school, the Goleta, California native preferred the autonomy of college, including the ability to customize his classes according to his own nascent curiosity. He earned his A.A., and, through a special transfer program, squeaked into UCSB. The move to the university was challenging — more tests, more work, more everything. But through a daily routine of long hours at the library, Zepeda began to find himself. “I really fell in love with school and learning when I got to UCSB,” he says. The library’s eighth floor, sparsely populated for most of the school year, had tables where he could spread out and windowed walls looking out across campus, with the ocean in the distance. “It felt like a room of my own. It was magical,” he recalls. From that refuge, he dove into the rich stories and cultures of his comparative literature courses. Then, inspired by his Holocaust Literature professor’s passion for her topic, Zepeda hatched a graduate school plan he describes as his “’Legally Blonde’ moment.” “I want to go for a doctorate!” he remembers thinking in a lightning-fast decision that echoed when the film’s lead character suddenly decided to enter law school despite minimal preparation. Eventually he decided on a master’s in English literature and raised his sagging GPA to 2.98 — close enough to SF State’s 3.0 requirement to get him admitted — conditionally — to the English Department. Even though he met his goal, scraping by yet again was deflating, and it took its toll on Zepeda’s self-esteem. 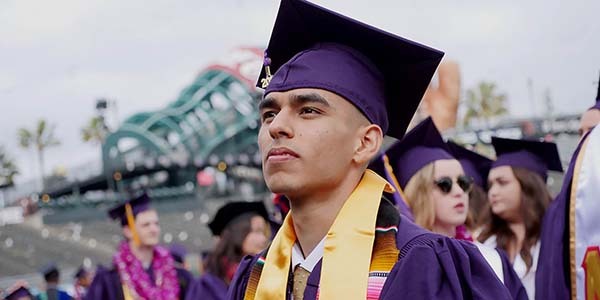 A year spent saving up money and organizing his financial aid helped smooth the transition to graduate school and SF State, and Zepeda knocked out his course requirements in two years. But when it came time to write his thesis, burnout set in. To take a break but still stay connected to school, he enrolled in a certificate for teaching reading to adults and became involved in extracurricular activities, serving as an officer in student organizations for English and comparative literature. Thanks to that self-granted two-year extension, Zepeda not only finished his thesis, but his forays into campus leadership led to an editorial internship with the city — experience he parlayed into an editorial job right after graduation, at the California School of Professional Psychology (CSPP), based at Alliant International University. The irony is not lost on Zepeda that it was his time spent away from his degree work that set positive events in motion. “My burnout led to doing student leadership positions, which led to an internship, which led to a job,” he says, retracing his erratic trajectory. Writing your own script, he was discovering, could be a really good thing. Recognizing that a professional degree created the means to achieve that end, he started taking classes in Pinterits’ program. When his contract ended — along with the free employee classes — heading back to SF State for a counseling degree made sense. “What I love about San Francisco State is it just represented a sense of home,” he says. 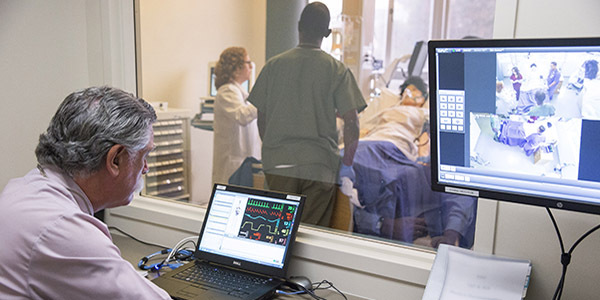 He especially liked that SF State’s numerous specializations within the counseling program — there are six — allowed him to learn about the variety of professional directions his classmates were heading in. 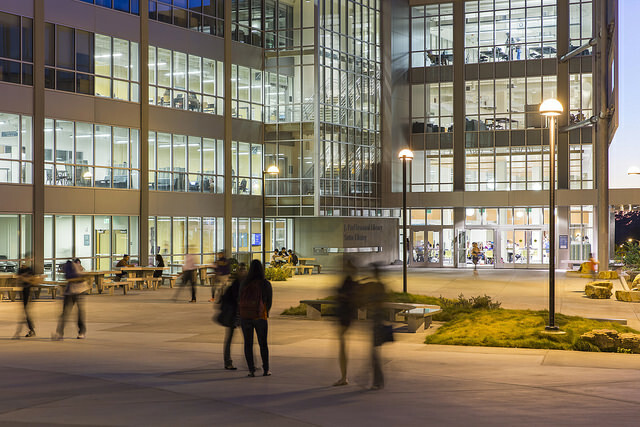 A double-coincidence of two CSPP faculty members, Tiffany O’Shaughnessy and Alison Cerezo, moving to SF State at the same time he did, added to the comfort zone. Professor Julie Chronister, his academic advisor, offered feedback and encouragement, sometimes extending office hours to accommodate his schedule. Chronister says Zepeda uses her input to strengthen his counseling skills, knowledge and attitude. “He is a quiet yet powerful voice for accessibility, social justice and cultural and disability competence,” she says of his passion for helping underserved populations, many of whom face barriers he himself had to overcome. Zepeda’s story is most remarkable for what it isn’t — it isn’t about grand, long-term goals or dramatic sacrifices to reach them. It isn’t about the labels that might be applied to him: learning-disabled, Latino, gay, and from a low-income home — though, he notes, those dimensions of his identity have certainly informed his life experience. Mainly, Zepeda defines his story as following the road his love of learning has taken him on so far, and letting go of judgment when he didn’t have highest GPA or the fastest finish time, or even a firm grasp on where each change would take him.